Brown-haired Dina is a cheerful thirteen-year-old sixth-grader. In the few years she's lived at SOS Children's Village Sarajevo, she changed from scared insecure girl to confident teenager. Coming from a difficult background, Dina had loads of sad memories of despair and uncertainty in her childhood memory case. She left them all at the doorstep of SOS mother Sanela's home. Sanela's cheery nature and ever-present smile leave no child sad and Dina was no exception. Being treated as equal family member helped Dina adjust quicker. In good times, like sharing mom's cake, and bad, like dusting, she received no special treatment. Soon, she developed a sense of belonging, grew confident and found her best friend, Ita, just next door. Soon Dina learned of the possibility to finish two grades in one school year. 'It will be hard for a year, but I'm sure I can do it,' the girl thought. She informed her SOS mom of her plans. 'The entire family gave her support,' explains Sanela. 'I wanted to release her from her chores, but she objected and agreed only to give away her vacuuming day. No one likes that chore, not even me when it's my turn,' laughs Sanela. Dina pulled her strength and patience together, barricaded herself with textbooks and started studying. Subject after subject she started passing the third grade, and by the end of the fall term she was done. It was a nice warm-up for the fourth grade through which she glided in the spring term. All done! Football fan since she was a toddler, Dina decided to give playing a shot. For the past six months she's been training regularly at a local all-girl football club. She started as substitute and since recently became a regular in the first team. A special event from a month ago will stay in her memory forever. 'The team we played was all older girls. We were scared before the match. The coach told us to have fun and not be scared. I agreed and told him I would have fun and I would also score. We all laughed. Into the first minutes on the field - I scored! The match ended a tie, but I scored!' Dina exclaims happily. I plan to keep on achieving! Dina's self-confidence and assurance is often motivation for the children around her. SOS mother Sanela says that Dina is also trying to influence her SOS siblings and friends to be more determined, proactive and fearless. 'I feel she can move a mountain if she decides to,' smiles Sanela. For now, maybe not move it, but certainly ski down one. 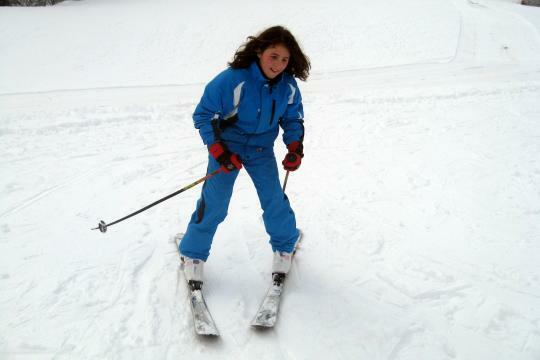 Dina's decision to enter an English language course and her brilliant performance at it as, well as her academic and sports achievements have earned her a five-day ski course this winter. 'I spent five days skiing at mountain Bjelashnica,' she explains. 'Uncle Damir (the village child educator, editor's remark) was taking a group of us good students on the slopes every day. It was my first time on snow. I felt comfortable immediately. I think I'll win a longer ski prize next year,' ends the determined girl. For privacy reasons, the names of the children were changed.